Welcome to our April Update! WAAD, Elections, Easter - Phew! Thank you Ben & Anna who kicked off World Autism Awareness Week with a fundraiser at The Old Moot House and raised £138.63! World Autism Awareness Day - We had a packed day at The Rose Theatre in Kingston on 2nd April for Express' World Autism Awareness Day event. Thank you to Dean Beadle, Saskia Baron & Joe, Max & Rosalind, for your inspirational talks, we were especially touched that Saskia's father Michael Baron came along to support us. All our speakers were very well received and in turn they all wanted to come back and talk some more!! We had stalls from SOS!SEN, Kingston Carers Network, Curly Hair Project, Balance, Hao2, NAS Surrey, Your Healthcare & AfC Participation officer Tom Quilter. Thank you to The Swallow Bakery at The Rose for allowing us to serve our cakes provided for us by our lovely supporters from the Kingston Soroptimists & The Kingston Lodge hotel. Our thanks also to Zac Goldsmith for coming along to support us. We hope everyone who attended felt the information, support and network opportunities were of great benefit. Tell us what you thought we'd love to hear from you. HUSTINGS - As part of the NAS 'I'm One' General Election Campaign we have been busy organising a hustings (pre-election Question Time)! This is a unique opportunity for a large number of us to raise our concerns and have our issues heard together by candidates from different political parties. Please see further details below. - So exciting!! We are now hoping to have a much needed rest for Easter, hope you do too! If you are a parent/carer please could you complete our short survey if you have not done so already. This will help us evidence need. Thank you. For further information on our upcoming events you can visit www.expresscic.org.uk. We need you! Please do join us for an Express Hustings.In the run-up to the 2015 General Election and as part of the 'NAS' I'm One' campaign, help Express make sure autism is a priority for every candidate looking to get elected. Ask your candidates what they will do to support people with autism and their families. The evening will be chaired by John Williams, parent, author and comedian - My Son's Not Rainman. The focus of the evening will be on Autism, SEND, Carers, Health & Social care. 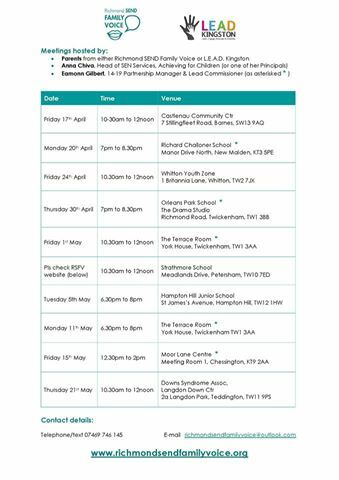 There will be an opportunity for you to ask questions of your prospective parliamentary candidates. Join Express for a lively evening! In addition there is an opportunity to book tickets for John Williams show My Son's Not Rainman to follow immediately after the hustings! This flyer was designed by students at Richard Challoner, if you woud like to help spread the word and know somewhere suitable to display them please do get incontact and we can drop them with you. Thank you. Autism and ill health: how to spot the subtle signs that something is wrong, read Saskia Baron's article here. 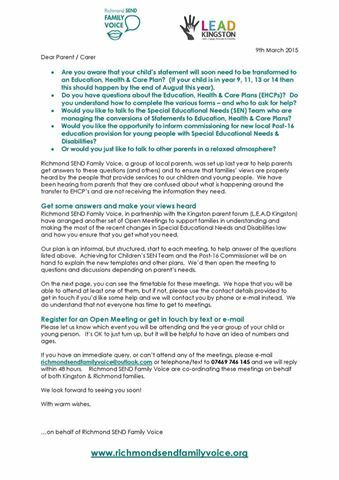 Information for families about the SEND reforms, in particular the conversion of statements to Education, Health and Care Plans. A series of meetings being held to help explain this and give you a chance to speak to the SEN team direct. Please see details here and dates. We have asked if additional times could be arranged, we will let you know. 'Teenage Girls with ASD' workshopYou are invited to a special event in London at 2pm on Saturday 11th April. This workshop is aimed at parents of teenage girls, and professionals who work and interact with young people on the spectrum. Although this workshop is about girls predominantly, there will be some content relevant to boys too, so feel free to attend, even if you have a son. Follow this link for more information and to book your place. Contact a Family: Busting Myths about Disability Allowance & eligibility - Find out more here.